well, 6 grams of carbon formed into buckycloth one atom thick would be about 3000 square feet. This strongest of known materials would also need ribs and edge bindings to create the optimal shape to take the strain of the solar wind. Then if the payload was also 6 grams this combined theoretical craft of 12 grams with .1 grams acceleretion would accelerate at about .008 G or 8 cm/sec/sec would bring the craft to about 2,500,000 meters per second after one year. 300,000,000 m/sec = light speed, so it would be about 1% of light speed. By now the solar drive would have dropped a lot due to distance from the sun, so this needs to be re-calculated in stages that match the decline of the solar drive to have any accuracy at all. It does show that light craft with high strength-light weight solar sails of bucky cloth are worth pursuiing for long term survey projects. Make the solar sail 1/2 mile on a side and the total force ramps up to nearly 1/2 pound. *Made sufficiently light* with ultra-thin material, that kind of force can do more serious acceleration over a few months. If I did the math right...if this thing were have .0002 pounds of force applied in the same direction for a year (not that it would), then it's change in velocity after a year should be about 198mph. Or 1978 mph in ten years. Unfortunately the amount of force drops rapidly as you move away from the sun. Type this into Google: (1000 watt/m^2)(3000 ft^2)/c in pounds As in the comments above, the total force from the light hitting the sail is .0002 pounds. The article incorrectly states that each photon carries 0.0002 pounds of force, while this is the total force delivered by all the light shining on the craft. Pressure is the force per unit area. the pound is a unit of force. In the world of imperial units a \"pound of pressure\" is generally meant to be pounds per square inch....thus .0002 pounds of pressure IS a unit of pressure. Looks like a minor misunderstanding here... the force of 0.0002 lb is the total force of all the trillions of photons transferring momentum to the spacecraft. Thus, the sail is resulting in a very small, but continuous, acceleration. 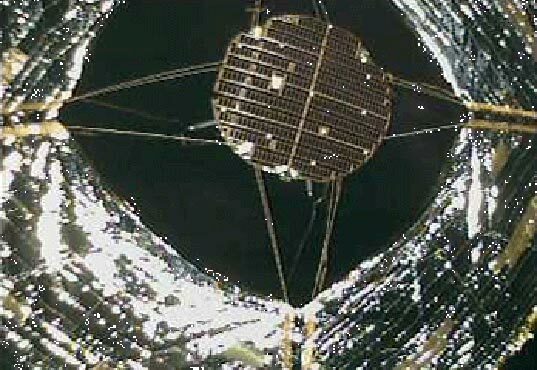 We've been following the progress of the Japanese spaceship IKAROS — the first to unfurl a solar sail in deep space. 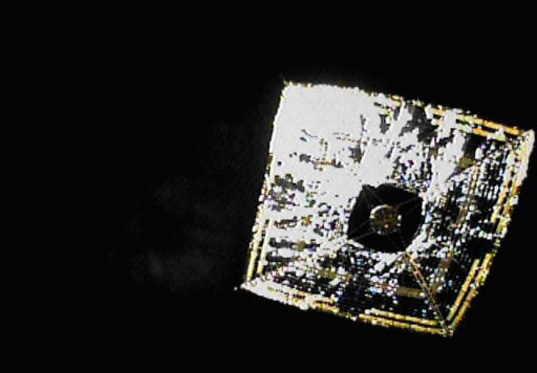 Today, the ship made the only first that really matters: it caught the sun's rays with its 3,000 square-foot sail and successfully used the energy to speed its way through space.